This three-storey, split-level building provides two dwellings side-by-side, for two families and sits among a strip of Victorian and Edwardian residences on narrow lots, in an inner Auckland suburb. Due respect was given to reinforcing the physical and architectural character of the neighbourhood. The building's mass was derived in part from the block of flats on one side, which also determined the height in relation to the street, while the cottages on the other side contributed their texture, alignment and their verandah structures - reinterpreted as double-height bay windows with shutters. 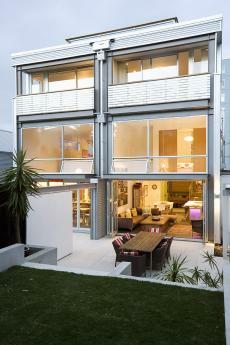 The materials used are those of these neighbouring buildings - plastered masonry, weatherboards and corrugated metal. An important element is the glazed stair structure that links the vertical stack of rooms split on the half-level between front and back, and which draws light and sun deep into the plan.